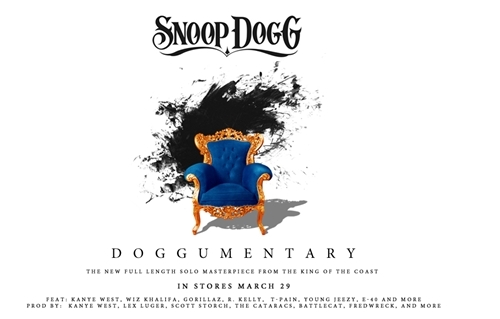 A promo poster Snoop’s new album Doggumentary reveals most of the producers and guest features who are expected to make cameos on the album. The impressive list has artists such as Kanye West, Wiz Khalifa, Young Jeezy, R. Kelly & more plus top producers Kanye, Scott Storch, The Cataracs & Lex Luger. Looks good. In stores March 29th.